Earth. 2230 AD. A time of social and political turmoil. Olag Gan wants to marry the woman of his dreams. Vila Restal wants to steal anything that isn’t nailed down. When they form a partnership, a perfect combination of strength and skill, it seems that nothing stands between them and the easy life. But fate hates to give a sucker an even break and the course of true love never did run smooth. 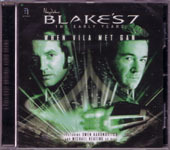 Though set after the events of the Blake’s 7 – Audio Adventures (Trilogy Box Set) |READ OUR REVIEW| When Vila Met Gan is primarily a prequel showing Gan and Vila back on Earth. There they work in the criminal underworld, Vila as a burglar and Gan as syndicate muscle. This is where the show shines, with Ben Aaronovitch having carefully constructed even more of the world he illustrated in the Trilogy Box Set. Very little of Earth was shown in the original television series – so Aaronovitch makes the tyranny of Earth actually tyrannical by drawing heavily upon the culture and lexicon of Aldous Huxley’s Brave New World. The story on Earth is set within a framing sequence in which a post-Trilogy Box Set Vila and Gan are visiting a colony world. They are there to take some much needed shore leave – but after they’ve spent all their money boozing up the planet Gan gets misty, and pines for his lost love back on Earth. It is at this point the narrative jumps back to Pre-Trilogy Box Set London (Rog Blake is still just a reformer candidate in upcoming planetary elections). The story itself runs 30 minutes. The writing is fresh and funny with Gan and Vila make a terrific pair. Michael Keating, reprising the role he created in the original TV series, sounds just like he did on the show (even 30 years on). Owen Aaronovitch plays Gan. Also noticeable in this script is Ben Aaronovitch’s addressing of the original TV series “teleport” capabilities. The TV B7 “teleporter” and Star Trek‘s “transporter” technologies have been seen by SF fans as a kind of deus ex-machina. I think that’s why they were left out of the Trilogy Box Set. But, in When Vila Met Gan, our stranded heroes bemoan the lack of teleport technology. It verges on self-parody, but in the context of the framing story it works very well. 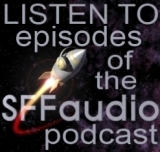 This is a serial audio drama series of the highest caliber. Also included on the CD are the Season 1 trailer, and the Season 2 trailer!